While concrete is a versatile and strong material, it’s not the best type of surface to walk on all day. It’s hard and very unforgiving on the body. Unlike softer surfaces like carpet or wood, concrete doesn’t absorb shock. Every move you make will be felt in your feet, legs, and joints. Worst of all, that uncomfortable feeling will stay with you long after you clock out. 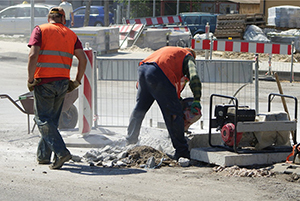 Construction workers and hard laborers that are around concrete for many years tend to suffer from lasting health issues. It can lead to lifelong joint problems, back pain, poor posture, and much more. While you may not be able to avoid concrete surfaces, there’s a lot you can do to keep your feet safe and comfortable. A pair of high-quality work boots can make all the difference. 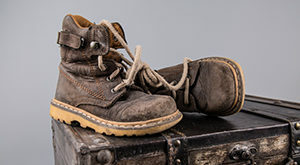 Many manufacturers craft boots that can withstand the rigors of concrete. They’ll protect your feet, absorb shock as you work, and help you avoid lasting problems. Here’s a list of some of the best work boots for walking on concrete all day. These boots from Irish Setter are as stylish as they are functional. The uppers are made of high-quality leather that’s stained and polished to a cool finish. The soles are made of thick rubber. They have a wedge design that utilizes a moderate arch for support. The wedged sole lifts to create a thicker heel. The bottoms feature a unique traction tread design to keep you stable no matter what conditions you’re working in. Inside the boots is a comfortable nylon lining. The boots feature a lace enclosure system They’re also rated to meet electrical safety standards and have a heat-resistant finish. From Wolverine is this pair of impressive work boots. They’re designed to keep you comfortable all day long, even on tough surfaces like concrete. One of the ways they do this is with the Multishox insole. It supports your arch and absorbs shock as you walk. Despite the superb support, it flexes to provide you with control and stability. It’s also completely removable for easy cleaning. The uppers are made from leather and feature 5.5-inch shaft with a full lace enclosure system. The sole is made from rubber. It’s arched for further support and is designed to keep you upright in slippery environments. There’s also a 1.5-inch heel. 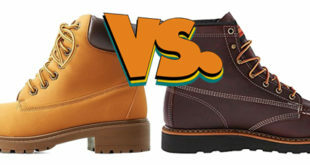 If you’re looking for maximum support during the day, consider this pair of work boots from Timberland. Inside the boots is a unique polyurethane midsole. This rigid midsole provides you with all the arch support you need to keep comfortable. It also absorbs shock and prevents your feet from getting fatigued. The midsole works in tandem with the nylon diffusion plate. The plate is built directly into the rubber sole. It gives you an added layer of support and provides some torsional rigidity to prevent injuries. The uppers are made from a sleek black leather. There’s also an antimicrobial lining to keep odors under control. 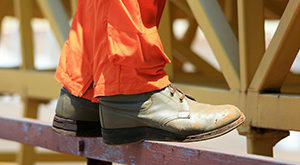 These boots from Caterpillar are a heavy-duty option for men that work in dangerous environments. 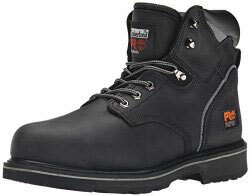 They’ll keep you safe and comfortable on virtually any construction site. To help you avoid the effects of walking on concrete, these boots feature a contoured insole. It’s shaped to follow the natural curves of your feet. This ensures that your feet are cradled in the boot instead of simply sitting on top of a flat sole. When you walk, the insole will help to absorb shock. The thick rubber sole also helps to take care of the force of impact. Additional features include leather uppers, full lace closures, and a steel toe cap. 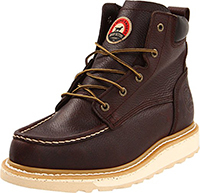 With Goodyear welt construction and high-quality leather uppers, these boots are made to last. They can withstand years of wear while keeping you comfortable in the long run. Inside, you’ll find comfort cushion insole made of Poron. This will cushion the blow of every step and let you walk with confidence. It works with a contoured footbed that’s designed to absorb shock. A fiberglass shank is also built into the sole. This shank keeps your foot stable as you walk on hard or uneven surfaces. It prevents unwanted torsional movements. The sole is made from polyurethane and utilizes a wedge design. How Does Walking on Concrete Affect Your Body? While you might not feel the effects of walking on concrete immediately, they’ll certainly catch up with you if you’re not wearing the right footwear. The first thing you’ll notice is the pain in your feet and knees. As mentioned earlier, concrete doesn’t absorb shock. It doesn’t flex when weight is applied. As a result, all that shock travels up your feet and legs. 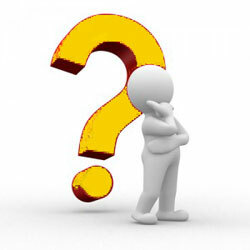 You may start to feel fatigue and experience significant strain on your legs. Shin splints are another common issue. The muscles are being overworked. As a result, the muscles will inflame. This can cause stiffness that affects the way you walk and work. Eventually, your knees and joints will feel it. That shock has nowhere to travel except to your joints. Years of poor foot protection can even result in arthritis. 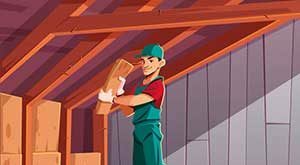 Plantar Fasciitis is a condition that affects many office and construction workers. It’s a result of poor heel and arch support. Essentially, the tissue that connects your heel to your toes becomes inflamed. The pain can sometimes be crippling. It often requires regular treatment. If left alone, it can eventually lead to significant tears and the loss of your arch. 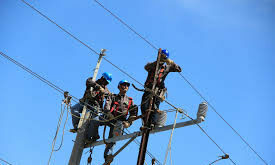 To avoid all of the problems associated with walking on concrete all day long, you should invest in a quality pair of work boots that provide you with the support you need. There are many features to look out for. By keeping an eye out on a few specific design features, you can narrow down your search to find the perfect pair of boots. The sole of your boots is the first line of defense against your feet and the concrete. A thick sole will keep you off the concrete and provide you with an effective barrier against shock. Go with options that have a thick and spongy sole. The denser it is, the better it’ll be in the long run. A thicker sole will do a better job at absorbing and spreading shock. This will prevent it from traveling up your feet. Not only that, but thicker soles tend to last longer. Your boots will experience a lot of wear and tear on concrete. Having a well-built sole that’s thick will save you the expense of having to get it replaced. A higher heel of around an inch will place your feet in a good position. Even something as small as an inch can have a noticeable effect on your comfort at the end of the day. When you walk, your heel should be the first thing that hits the ground. This is where most of the shock is experienced. By having some extra height, your boot will take care of most of the shock before you even place the rest of your foot down. Nothing is worse on your feet than wearing an ill-fitted shoe. Your boots need to fit well to do their job. Make sure to take accurate measurements of your feet before you purchase a pair of boots and choose an option that lets you get a snug fit. It’s best to avoid boots with only velcro or zippers. Lace-up boots that extend far above the ankle are your best bet. They conform to the contours of your foot so that there’s no unnecessary wiggle room that will cause discomfort. Insoles act as a comfortable bed that cradles your foot. They can be made from a variety of different materials and have varying levels of softness. Whether you choose to go with cushioned insoles or options made from gel, it’s a good idea to have something that can support the arch of your foot and absorb some shock. You can always get removable insoles to make your boots even more comfortable. Many are contoured to fit the shape of your feet and come with additional features to add versatility. Concrete is a pretty slick surface. Depending on the level of polish and grit, it can be dangerous to walk on when it’s wet. Keep yourself safe from harm by getting boots that have slip-resistant treats. These boots have lugs that redirect water from key pressure points on your feet. They prevent water from collecting underneath the sole so that you always make contact with the ground. Walking on concrete all day doesn’t have to be uncomfortable. By looking out for some key features like a thick heel and a top-notch support insole, you can find a pair of boots that dominate any concrete surface.